You’ll need some specialized boots for snowboarding. Not only do the proper boots keep your feet warm, they help you control your board. It’s possible to use hard-plastic boots, just as skiers do, for snowboarding. “Hardbooting,” is much more prominent in Europe than in the United States, where soft boots prevail. The benefit of soft boots is that you can walk in them fairly easily. They come in many brand and models. Just as shoes come with varying mechanisms to keep your feet inside them (loafers, laces, velcro straps), so it is with snowboard boots. Some use extra-thick, extra-long laces that resemble what you would find on tennis shoes. Other use a “quick lace” system that uses a plastic pull tab. Pull the strings up, slide the tab down onto your foot, and go. More expensive boots use a Boa closure system. Once these systems are set up in place, it’s very easy, compared with laces, to tighten or loosen your boot as required. Each system has its advantages and disadvantages, including ease of replacing broken parts, ease of fastening the boot together, making micro-adjustments on different parts of the foot, and susceptibility to breakage. A good sales associate at a snowboard shop can walk you through the details. 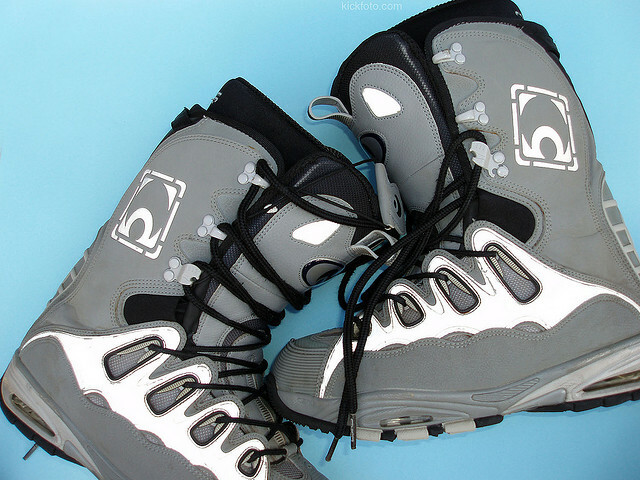 Some snowboard boots are stiffer, while others are softer. As with snowboards, stiff is good for going faster, while flexibility can be an asset in the terrain park or in doing freestyle moves. While snowboard companies may rate their boots on a flex-to-stiff scale, the scales are not uniform across companies. Snowboarding expert Kevin Ryan has some things to keep in mind when you select a boot in the section fitting boots to your feet.